Are you are looking for the best and most trusted picture hanging system? You are going to LOVE the Picture Hanging Gallery System! and adjustable hooks that slide up and down for vertical positioning. Total flexibility… adjust and rearrange to get the perfect display. Precision picture hanging at its very best ! 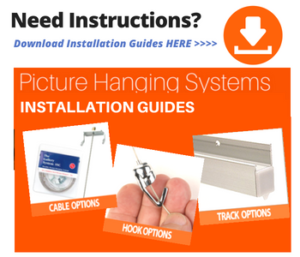 3 STEPS to getting a Perfect Picture Hanging System that'll last for years ! 2 Metre Stainless Steel Hangers insert anywhere along your Picture Hanging Track. It is recommended to allow for 2 Cables for each picture. The Push Button Hooks slide onto the stainless steel cables make hanging your pictures a total breeze. We recommend to allow for 2 Hooks per picture for the optimum results and perfectly straight pictures. 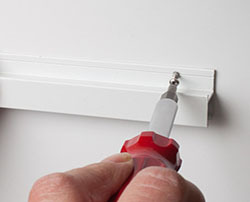 Ready To Hang Pictures the Easy Way? GO AHEAD - Order Your System HERE NEED SOME HELP ? 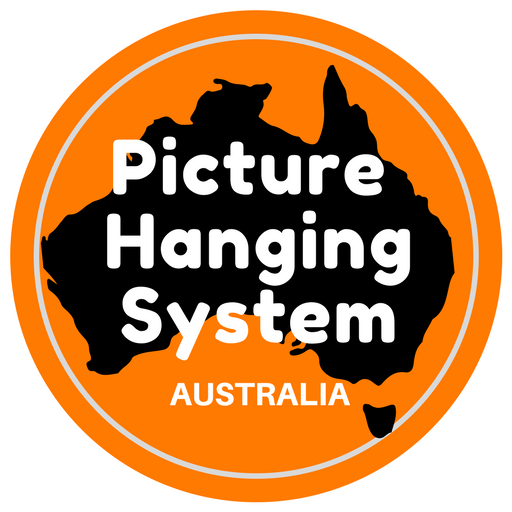 The Australian made Gallery Picture Hanging System is manufactured to the highest quality standards. Once installed, your system will last a lifetime. Yes, the Professional Gallery Picture Hanging System is designed for those who desire the very best picture hanging solution that money can buy. 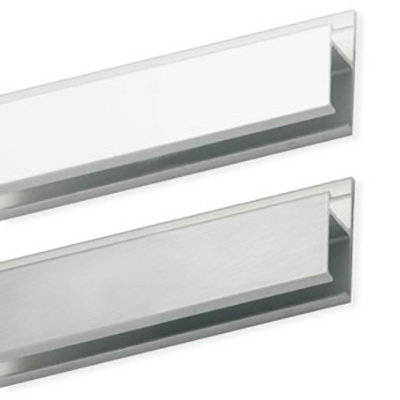 Due to the Gallery System Picture Hanging hardware components being proudly manufactured in Australia, the highest standards of workmanship and materials are utilised to provide you with an installation of optimum appearance and premium quality. 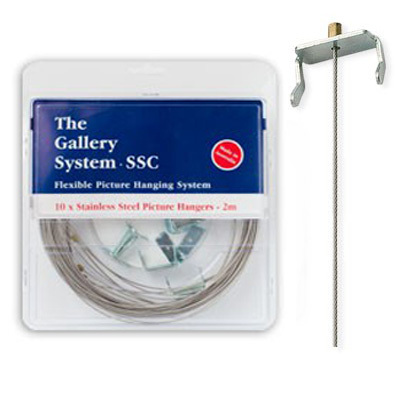 The ease of use also makes this the Gallery Picture Hanging System the very best solution for every picture hanging application. That is why leading architects and builders throughout the world recommend the Gallery Picture Hanging System for use in Professional Galleries, Homes, Offices, Government Installations, Libraries, Exhibitions, Aged Care Homes and more. With its clever design, positioning your hanging rails is super easy as the rails adapts to fix to many wall construction types whether they be plaster, rendered or a Gyprock style of plaster board. 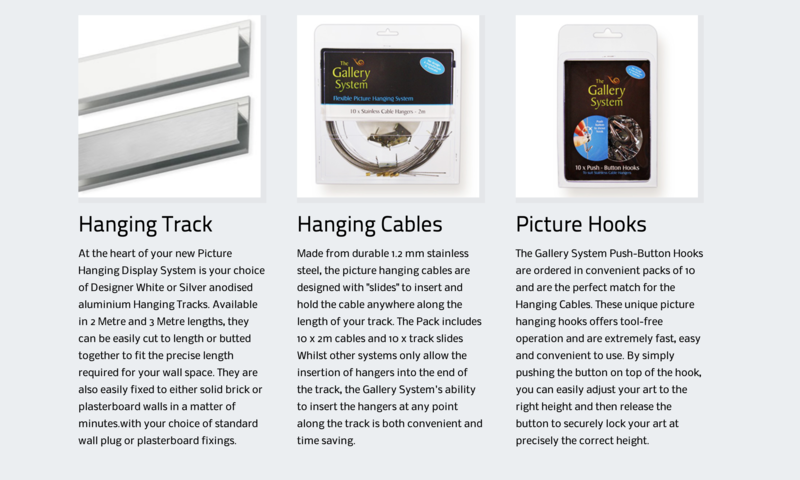 Installation of your Gallery Picture Hanging System will be quick and easy. That is also why the Gallery System is perfect for homes, shops and offices and many other applications where you want pictures and art to be perfectly displayed. One of the key benefits when you install the Gallery Picture Hanging System will be that you don’t end up with annoying and unsightly damage or holes in your walls. You, therefore, are going to be able to safely hang your pictures. 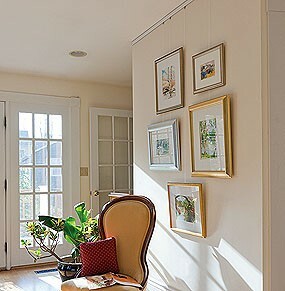 change your art display around quickly and as often as you wish and have the perfect display every time. With our network of fast and reliable couriers, you’ll get your new Gallery Picture Hanging System delivered in a few days … anywhere in Australia! 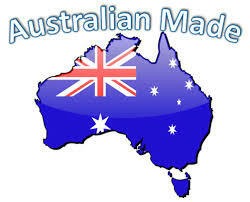 The easy, online ordering system on this website will make it easy to place your order and track your delivery ensuring that you receive your Gallery Picture Hanging System fast and to all regions anywhere in Australia. Yes, you can easily place your order for your selected components via this website today and we’ll make sure that your new Picture Hanging System will arrive in just a few days. Of course, if you have any questions or require any advice or assistance in placing your order, simply click the “contact us” link and one of our team of picture hanging experts will be delighted to assist. You’ll be creating your new and exciting gallery art space and proudly admiring your new picture display in no time at all. 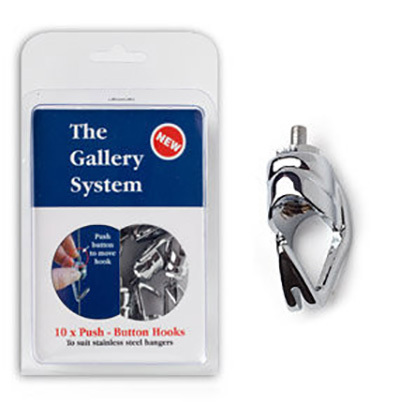 Bring your art and pictures to life with the optional and flexible Picture Lighting Wands that are a unique feature of the Gallery Picture Hanging System. Another great feature of the Gallery Picture Hanging System is ease of lighting your artwork with the optional, clip-on, Lighting Wands. The unique, low voltage Picture Lighting Wands simply attach anywhere along your picture hanging track ensuring every single picture is perfectly highlighted …. Your pictures will come alive and always look totally sensational! 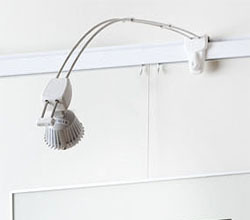 Yes, with an easy to install cable that discretely hides out of sight (in a specially designed cavity on top of the picture hanging track), the Picture Lighting Wands simply clip anywhere along your gallery picture hanging track and are easily positioned and/or re-positioned at any time. The picture lighting system is really a very clever and smart addition to your hanging system and a very easy to install alternative to traditional and expensive picture lighting methods.